Maxwell was the adjudged the Player of the Match. Melbourne Stars were needed to win their last round-robin in order to progress to the semi-final of this edition’s Big Bash League (BBL). 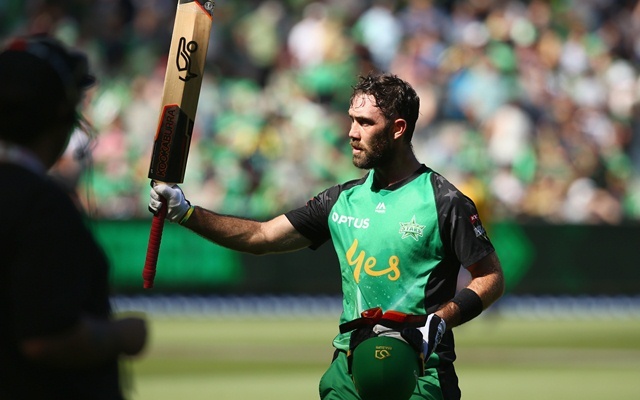 The team, captained by Glenn Maxwell, defeated Sydney Sixers by 94 runs at the iconic Melbourne Cricket Ground (MCG). With this victory, they also knocked out Chris Lynn’s Brisbane Heat, who had a chance of sneaking through on the basis of Net Run Rate (NRR). After the Sixers won the toss and elected to bowl first, the hosts racked up a significant 168 for six in 20 overs. Sean Abbott nipped out Ben Dunk for one. Marcus Stoinis was starting to find his feet, having notched 34 runs from 23 balls with seven boundaries, but Tom Curran nipped him out. Peter Handscomb scored 35 runs at a tad over a run-a-ball and fell prey to left-arm spinner Steve O’Keefe. At the other end, Maxwell was in a different zone and he played a captain’s knock of 82 runs from 43 deliveries with four boundaries and half-a-dozen sixes. He got out to Ben Dwarsuis and it was because of him that the Stars managed to give their innings the much-needed finishing kick. For the Sixers, Curran was the standout bowler with a couple of wickets. Dwarshuis, Abbott, and O’Keefe got a couple each. The Sixers had a run-chase equivalent to a horrific dream as they were bowled out for a paltry 74 in 13.4 overs. Only one of the top five batsmen- Daniel Hughes- got into double figures. Jackson Bird struck first blood with wicketkeeper Josh Phillippe’s wicket. Fast bowler Frank Worrall picked up the prized wickets of Hughes and James Vince. Maxwell contributed with the ball as well, dismissing Moises Henriques. The fifth wicket fell in the form of Jordan Silk. Tom Curran spanked a couple of fours and he was trapped plumb in front by Nepal spinner Sandeep Lamichhane. By then, the match was strongly in favour of the Stars. The home team used only five bowlers and each of them picked up at least one wicket. Lamicchane churned out three wickets. Zampa and Worrall got two important wickets each. That is @Gmaxi_32 at his very best!! Brutal striking!! Do you think the 6s can chase these down? Glenn Maxwell is one of the few true geniuses in contemporary cricket. If Maxwell was Indian he'd be India's Test opener.